Click on the Logo for a thirty-minute presentation on Pansophic Freemasonry. If a slide hangs, click on it anywhere to advance. Also click HERE for a pdf file of the notes to slides 15-98. Pansophic is an irregular Masonic obedience of men and women. 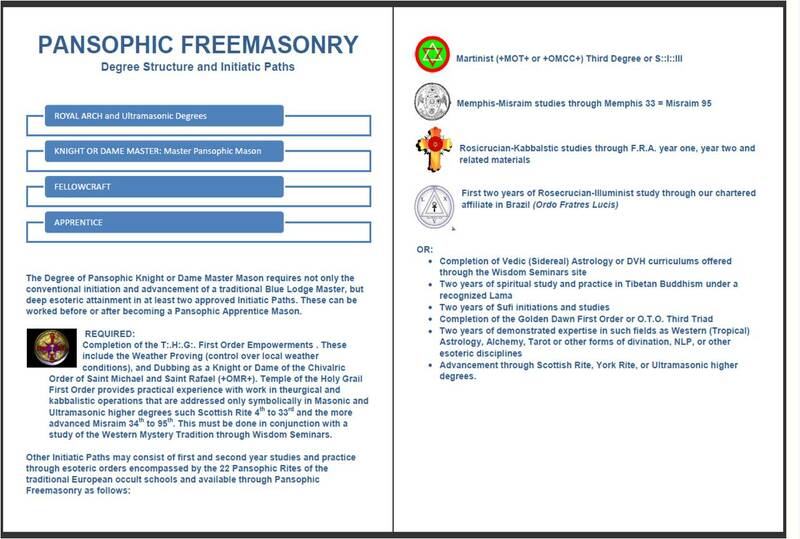 Our mission is to preserve, study, improve, develop, practice, and perpetuate the esoteric spiritual and initiatic degrees and schools associated with the Pansophic Rites of Freemasonry and other spiritual traditions as part of the general Masonic practice of social and self-improvement, and to revive the universal and spiritual traditions of Freemasonry as they were originally practiced by speculative or philosophical Masons within the context of Rosicrucian, Templar, Kabbalistic, Gnostic, and other esoteric European schools. Collectively, these spiritual paths were known as the Graal or sacred Grail. ILLUMINIST: Order of the Illuminati; Order of the Martiniste; Order of the Rose Croix of Heredom; Order of the True Rosy Cross; Order of the Ecclesiae Rosicrucianae Catholicae; Order of the Holy Royal Arch of Enoch; and the Hidden Church of the Holy Grail. In 2009, Dr.Lewis Keizer, who also holds the office of Grand Master of the Brotherhood of the Illuminati or Fratris Lucis added the Order of the Fratris Lucis to the Pansophic charter. MASONIC: Ancient and Primitive Rite; Rite of Memphis; Rite of Misraim; Ancient and Accepted Scottish Rite; Swedenborgian Rite; the United Templar Lodge. Freemasonry preserves ancient world-wide streams of profound initiatic spiritual tradition that Freemasons have a responsibility to study, practice, develop, and intelligently adapt for future generations. Click here for pdf file of this chart. Please note that the GWB and HOOM paths are no longer offered. Students accepted into the Home Temple Ordination Studies, School of Sacred Studies, JIVA, DVH, and/or T:.H:.G:. are pre-qualified as Candidates for Initiation into Pansophic and may formally apply with guaranteed acceptance at any time. They will be Initiated and Advanced during scheduled Ordination Seminars and should take this link for the APPLICATION TO PANSOPHIC. Once application has been made, Candidates for Initiation will study the Entered Apprentice Handbook, a multimedia presentation about Pansophic Freemasonry, and submit an email-attachment file of 70 questions that must be filled out with brief answers. The questions serve as a review of the material presented in the Entered Apprentice Handbook. The file must be received with correct answers before Candidates will be invited for Initiation (usually during an Ordination Seminar weekend). Currently we are not taking application for Initiation or membership from those who are not seminarians or clergy of the Home Temple community, or who are not registered students in JIVA (Vedic Astrology) or DVH programs of the Caduceus Institute. However, we intend to open Pansophic to qualified applicants in the near future. The Pansophic Study Lodge is not intended to compete with or substitute for regular Freemasonry. Its initiations and advancements are not to be confused with regular Freemasonic degrees. Pansophic is a separate obedience not associated directly with regular Freemasonry, and therefore is not bound to any Masonic oaths nor to the Anti-Co-Masonic Oath taken by every regular Master Mason to never make a woman a Mason. Regular Freemasons are free to participate without fear of violating oaths. Nevertheless, Pansophic membership is kept secret and never revealed. Previous regular Masonic advancement does not fulfill the Pansophic Initiatic Path requirements, which are necessary for advancement to Pansophic Fellowcraft and Knight-Master degrees. Therefore regular Master Masons are accepted as Entered Pansophic Apprentices until the Path requirements have been met. Once Path requirements have been met, they do not require ritual advancement but merely Grand Lodge recognition of them as Pansophic Fellowcraft or Pansophic Knight-Master, as qualifications merit. Conventional EA's and Apprentices will also begin as Pansophic EA's. The Pansophic Masons operate in three modalities: LOCAL CONVENTICLE, LOCAL LODGE, and GRAND LODGE #1 ST. GERMAIN. These allow for the women and men of Home Temple and THG in locations too distant for physical meetings to participate and make progress in Pansophic Freemasonry. LOCAL CONVENTICLE: Chaired by one or more Masters of Grand Lodge; private study, initiation, and advancement. Leads to establishment of Lodge when three Masters have been raised. LODGE: Convened twice annually at or near the Equinoxes. Physical meeting at a geographically convenient location for Masonic initiation and advancement. All Pansophic Lodges are opened in the Entered Apprentice Degree, and members occupy the offices of each Lodge in a queue order, moving up one office on each Equinox. 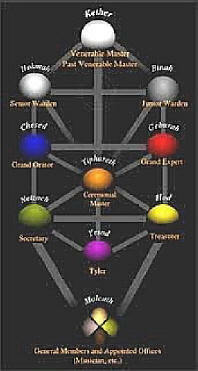 The offices are Sephirotic positions on a Kabbalistic floor. It is desirable for every member to experience and qualify each of these energies as part of Blue Lodge operation and advancement. GRAND LODGE #1 ST. GERMAIN: Convened as a Conventicle or Grand Lodge at the pleasure of the Grand Master and/or Deputy Grand Master as necessary. Opened in the Entered Apprentice degree for all Pansophic Masons who are able to attend. In order to protect members from harassment or misguided accusations of breaking their anti-co-masonic vows in other male Masonic obediences�which oaths are binding only for their specific obediences--it will keep the identity of its membership absolutely and inviolably secret. Masonic secrecy refers to the signs, tokens, grips, words, and other initiatic secrets that Freemasons have obligated themselves never to reveal except to other Freemasons under specific circumstances. Even though people can purchase books that reveal Masonic secrets, the initiate promises never to discuss them or communicate about them to non-initiates. Regular Freemasonry requires blood-oaths, that is, obligations of secrecy that include symbolic penalties of torture and death for transgressing. Pansophic does not use abusive oaths. Rather, the initiate simply promises to honor initiatic secrecy. This secrecy is a test of the initiate and his / her spiritual commitment, and it must be meticulously respected. One might ask why these secrets cannot be discussed publicly, even though they might be published and available to anyone as a result of oath-breaking in the past. It is a matter of individual honor and integrity. One does not publicly discuss the details of one�s intimacies with a lover, or the internal issues of family or friends. By the same token, Masonic secrecy is sworn to seal the intimate spiritual unions that connect all initiates, and regardless of what may or may not be publicly claimed, it is the obligation of the initiate to remain silent at all times. After each meeting to initiate or advance, a Conventicle or Lodge will send an updated electronic file of its membership to the Grand Lodge Secretary, who will integrate it into the private Grand Lodge Membership Files. No dues are assessed. However, individual members are expected to assist their Conventicles or lodges with any expenses for rental of facilities, purchase of Masonic regalia, food, and operating expenses. necessary offices to them to assist in rituals or offer lectures and presentations. The official Blue Lodge rituals are adapted from the French alchemical Rites Moderne, including the Chamber of Reflection, swords, and white gloves. Currently Grand Lodge St. Germain is convened for Blue Lodge rituals at the Home Temple yurt in Aromas, California, once annually or as needed. Initiation as a Pansophic Apprentice, Passing as a Pansophic Fellowcraft, and Raising as a Pansophic Knight- or Dame-Master are done in one combined ritual. The degrees are transmitted once all study and practice requirements for the degree of Pansophic Master have been satisfied. It is Pansophic policy to transmit the the Blue Lodge degrees only by conferral. Therefore candidates must travel at their own expense to California to receive them. Home Temple clergy may combine ordination, consecration, dubbing as Knight or Dame of the +OMR+, advancement to +MOT+ Martinist S::I::III or IV, and advancement to Second Order THG with reception of the Pansophic Master Mason degree in one visit. Grand Masters, Lodge Masters, and Past Masters qualify for the Royal Arch Degree, which may be conferred upon them during or after Installation. Higher Degree transmissions of Memphis-Misraim may be done in a Virtual Lodge opened in the Royal Arch Degree by a single Royal Arch Knight- or Dame-Master of the Memphis-Misraim 90th Degree under the approval and guidance of the Vicarius Salomonis Grand Master or Deputy Vicarius Salomonis. Each new Lodge must be established by at least one officer of the Grand Lodge delegated by the Grand Master, who will travel to the new site at the expense of the new Lodge to oversee the installation ritual and convey the Charter, which will be signed by the Grand Master. He or she will also train and drill the new Lodge officers in the details of conducting the three degree rituals. Blue Lodges will always open in the Entered Apprentice Degree so that all Lodge meetings, including the three degrees of advancement and raising, will be open to all members. All Pansophic Entered Apprentices must choose at least TWO PATHS of esoteric study to advance to Fellow Craft and Master as described in Degree Structure and Initiatic Paths at the top of this web page. The Pansophic Rites of Freemasonry will accept credentials and degree-work from all Masonic and Co-Masonic obediences that offer traditional Masonic initiation. In addition to the traditional male Masonic obediences, these include both branches of Co-Masonry; all members of the French Grande Orient such as Memphis-Misraim, all forms of the Prince Hall Lodges and their Co-Masonic Egyptian and other independent organizations, and exclusively female Masonic organizations.